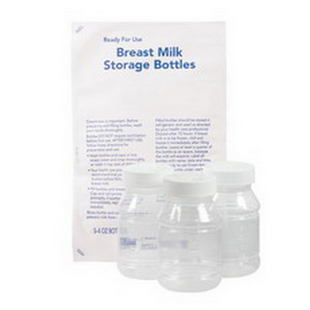 Plastic (polypropylene) bottles designed for use in storing human milk. Standard (40-mm) plastic bottle caps fit on 4-fl-oz human milk storage bottles and the 8-fl-oz plastic bottles. Bottles are ready for use—do not require sterilization before first use. Bottles and caps are food-grade quality. Cleanliness is important. Before preparing and filling bottles, wash your hands thoroughly. Wash bottles and caps in hot, soapy water and rinse thoroughly; or wash in top rack of dishwasher. Your healthcare professional may recommend that you sterilize bottles before filling them with breast milk. Fill bottles with breast milk. Cap and refrigerate or freeze them promptly. If bottles are not filled immediately, replace caps until needed. Rinse bottle and cap following use to prevent milk from sticking to bottle. Filled bottles should be stored in refrigerator and used as directed by your healthcare professional. Breast milk should be used or frozen within 48 hours of expressing. Leave some empty space at the top of the bottle for milk to expand as it freezes. Label all bottles with name, date, and time. When ready to use frozen breast milk, swirl bottle under warm tap water to thaw. Feed thawed breast milk right away or refrigerate; do not refreeze. WARNING: Never use a microwave oven to thaw or heat milk. Serious burns can result.